A modern secretary in brightly enameled steel that my clients fondly refer to as the “yellow fellow” defines this first space. I love how this piece has a place for everything: It’s both display space to incorporate personal mementos in an organized and cultivated way while, at the same time, it cleverly conceals the mundane necessities of running a household. It provides a great workspace for two people but it’s not utilitarian; it’s imaginative and not yet another built-in. The dose of color is so happy: nothing is better than pairing utilitarian tasks such as paying the bills with an uplifting space. The horizontal piece of art above the desk is terrific; it’s unique and the perfect final touch for my art-loving clients. This sweet, feminine niche is tucked away in the butler’s pantry between kitchen and dining room. 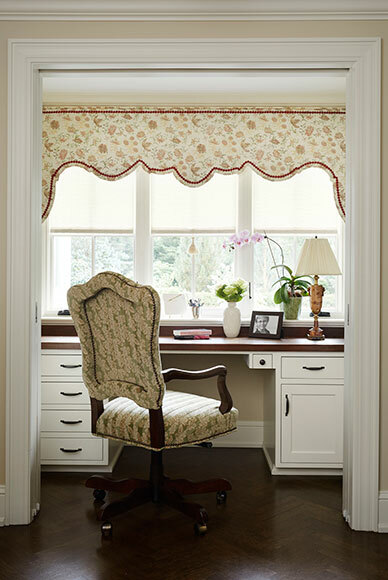 Here, pocket doors open to a desk flooded with natural light, filtered by plissé shades. This is an example of a straightforward built-in being defined by a shaped, upholstered cornice. The shape of the chair back reflects the shape of the window treatment. While it’s beautiful open, I love how the pocket doors can be closed to conceal the workspace when the desk does not appear ready for guests! 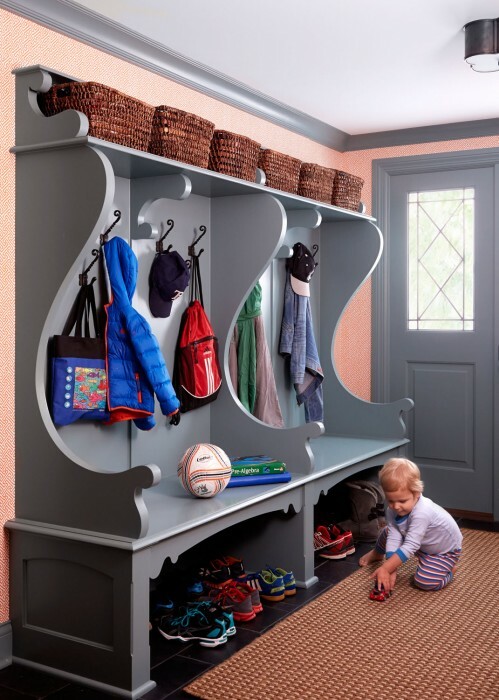 This mudroom was born by carving out some space from the garage in order for my clients’ husband and children to have a place to contain all the trappings of every day life. While she wanted it to be playful, there’s a sense of organization with a basket for each family member, including three small kids. The custom bench, inspired by a modern take on Belgian design, is the focal point of a simple space. The bench is in keeping with the house and feels authentic but it’s fresh with a bright coat of peacock blue. A black slate floor with indoor-outdoor area rugs welcome even the muddiest boots and the fun, printed coral wallpaper takes the utilitarian space up a notch.